Thursday, September 20 | 6pm – 8pm | CRC, 40 Oak St. Bringing together struggles against gentrification unfolding in neighbourhoods in Toronto and Hamilton, this Speakers Series will profile successful models of resistance people are using to push back and win. Join us! Julia Manzo is a resident of Parkdale, and one of the organizers of the successful rent strike in Parkdale last year. She is also a member of Parkdale Organize. Bjarke Risager is an organizer with the Hamilton Tenants Solidarity Network. 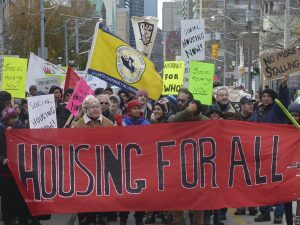 Gaetan Heroux is a member of OCAP and has worked and fought for housing in the downtown east end of Toronto for over three decades.